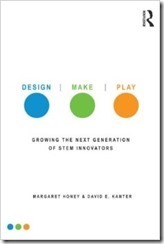 Design, Make, Play: Growing the Next Generation of STEM Innovators is a resource for practitioners, policymakers, researchers and program developers that illuminates creative, cutting edge ways to inspire and motivate young people about science and technology learning. The book is aligned with the National Research Council’s new Framework for Science Education, which includes an explicit focus on engineering and design content, as well as integration across disciplines. Extensive case studies explore real world examples of innovative programs that take place in a variety of settings, including schools, museums, community centers, and virtual spaces. Design, Make, and Play are presented as learning methodologies that have the power to rekindle children’s intrinsic motivation and innate curiosity about STEM (science, technology, engineering, and mathematics) fields. A digital companion app showcases rich multimedia that brings the stories and successes of each program—and the students who learn there—to life.